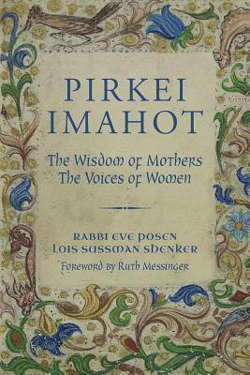 Pirkei Imahot is first and foremost a book about giving Jewish women a voice within our Jewish tradition. Through that voice, the reader is given an opportunity to gain new inspiration, motivation and the clarity of purpose needed to move forward to make change in a world much in need of it. Just as Pirkei Avot, the rabbinic commentary written by rabbis in the 2nd century, C.E., provided an ethical road map for the community of its day, Pirkei Imahot provides an ethical road map written by and for contemporary women today. Through the authors’ own unique experiences as women, mothers, leaders and teachers in their community, and those of the many women who contributed their own words of wisdom to this book, the reader will gain wisdom on how to live morally within her community, how to participate in tikkun olam, [the repair of the world] and how to strengthen her leadership roles to make a difference. The probing questions found throughout the book provide a further opportunity, through introspection and self-examination, for the reader to learn the lessons found within the covers of this thought provoking book!